Is the Performance Nutritionist for the Toronto Raptors (NBA). Has provided nutrition services for the Toronto Maple Leafs (NHL) and Toronto Marlies (AHL). Has provided nutrition support for Major League Soccer's Toronto FC. Is the Nutritionist for the Athletics Canada's Eastern Hub training group in Toronto, is a member of the Integrated Support Team (IST) for Swimming Canada, and serves as the Lead Dietitian for Gymnastics Canada's Women's Artistic Gymnastics Team. Works with athletes and active individuals of all levels, ranging from weekend warriors and adult athletes to national, Olympic, and Paralympic team members in a wide range of sports, including artistic gymnastics, figure skating, track and field, speed skating, hockey, rowing, sailing, squash, rugby, wrestling, trampoline, tae kwan do, and triathlon, including several world and Olympic medalists. Has served as the personal dietitian for professional athletes in a variety of sports, including athletes in the NHL, CFL, Major League Baseball, Major League Soccer, professional tennis, Ironman Triathlon, and mixed martial arts. Has been an invited speaker for a wide range of sports groups, teams, and organizations including Athletics Canada, Skate Canada, Gymnastics Canada, Swimming Canada, Hockey Canada, and the Canadian Soccer Association. Provided preparation services for Canada’s national trampoline team (2006-2008), and rhythmic gymnastics group (2012) in preparation for the Olympic Games. Is an ISAK (International Society for the Advancement of Kinanthropometry) Level 1 anthropometrist. Holds a Board Certification as Specialist in Sports Dietetics (CSSD) from the Academy of Nutrition and Dietetics. Has published peer-reviewed research in the area of energy availability in elite sprinters, as well as nutrition strategies to support optimal performance in track and field. As a result of her experience in sport nutrition, Jennifer was appointed to the College of Dietitians of Ontario’s Sports Nutrition Lab Test Expert Advisory Panel in 2010. She was also instructor of High Performance Nutrition as part of Sheridan College’s Human Performance Training Certificate from 2011-2013, and led Gymnastics Canada's Level 4 NCCP Coaching Certification program for nutrition in 2014 and 2018. In 2019, Jennifer co-authored two peer-reviewed papers commissioned by the Intarnational Association of Athletics Federations (IAAF) on the role of nutrition for performance in sprinting and field events. Jennifer routinely presents at sports nutrition conferences, including the Canadian Society for Exercise Physiology (CSEP), Own the Podium's Sport Innovation (SPIN) Conference, the National Sport Science and Medical Advisory Council (NSSMAC) Conference, and the American College of Sports Medicine (ACSM). Learn more about nutrition counselling with Jennifer, Sports Nutritionist. 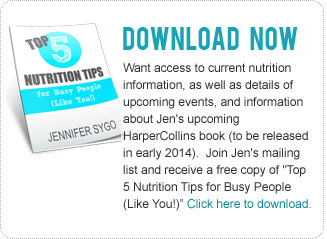 Book Jennifer for your next sports nutrition event by completing the form below. Thanks so much for the information you shared at the conference. You are a joy to listen to and we were all buzzing about the tremendous gift you have in communications! Looking forward to future seminars or webinars of yours!" --Registered Dietitian and conference attendee.